This cake is perfectly moist and filled with chocolate and several other incredible ingredients! In a large mixing bowl, combine applesauce, sugar, butter and eggs. Add flour, cocoa, baking soda, salt, cinnamon, nutmeg, and cloves. Stir in chocolate chips. Combine the topping ingredients and sprinkle over the cake. 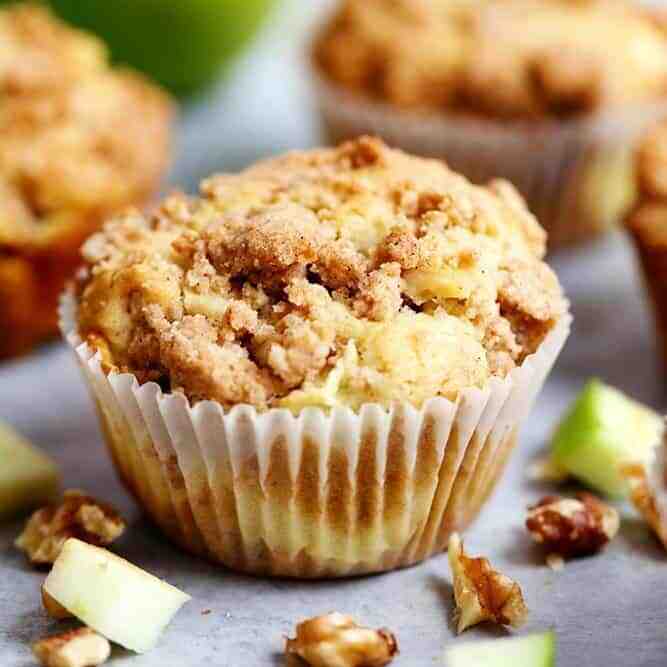 Apple Cream Cheese Crumb Muffins are the perfect buttery and moist apple walnut muffins with a hidden cream cheese center. Topped with a cinnamon sugar crumb topping these are the perfect fall muffins! Preheat oven to 375 degrees. Line a 12 cup muffin pan with liners. In a medium sized bowl mix flour, baking powder, baking soda, and salt. Set aside. In a large bowl beat together butter, sugar, and eggs until smooth. Mix in vanilla. Stir in apples and walnuts. Gradually add in the flour mixture and mix until combined. Add 1 tablespoon into the bottom of the muffin liners. To make the cream cheese mixture: Beat together cream cheese, sugar and egg yolk until smooth. Put about 1 tablespoon on top of the bottom of the dough in the liners. Top the cheesecake layer with the rest of the dough and fill to the top. To make the crumb topping: Add the brown sugar, cinnamon, and butter to a small bowl and mix. Add the flour until it starts to become crumbs. Top the muffins with the crumb mixture and lightly press into the top. Bake for 20 minutes or until toothpick inserted into the center comes clean and the tops are lightly brown. Let them sit for 5 minutes and then remove to a wire rack to cool.